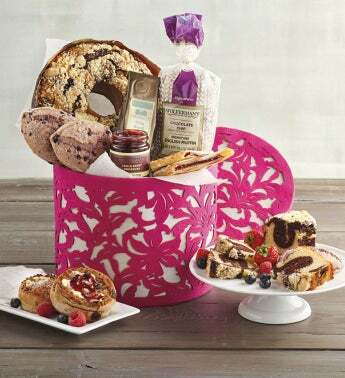 Give a sweet pick-me-up gift with plenty to share and enjoy. Covered in a beautiful pink felt design, this hat box is sturdy and reusable. Lift the lid to reveal a chocolate and vanilla swirl coffee cake, chocolate chip signature English muffins, a raspberry kringle, two blueberry scones, triple berry preserves, and Tiffin Blend coffee.